Anthony Joshua was comfortable and relatively commanding during his points victory over a stubborn Joseph Parker at the Principality Stadium in Wales. Having won, Joshua is now holder of IBO, IBF, WBA, and WBO championship belts and has his sights set on an interesting clash with Deontay Wilder to become undisputed heavyweight champion of the world. During the build-up ahead of this bout, Parker said that he’d start quickly and effectively utilise his speed to frustrate Joshua – who has a two-inch height advantage and significant reach differential to go with it. He was composed in the media, calm and quietly confident that he’d surprise critics with a victory away from home, something no man has managed against Joshua during the 28-year-old’s professional career to date. Despite carrying a different aura to those before him, this was billed as a litmus test: would he buckle under the pressure, or embrace it and prove his quality was as good as his coach David Higgins made it out to be? With more ring experience (123 completed rounds to AJ’s 63) despite being two years younger, it was certainly going to be an interesting encounter. In the first few rounds, Joshua was relatively comfortable and utilised his quick jabs to good effect. Forcing Parker back without really trying too hard, the New Zealand international initially struggled to find his range and could have easily found himself in a lot more trouble if not for some tactical manoeuvres to avoid being constantly hit. In rounds four and five, Parker attempted to up the tempo and find a useful counter for Joshua’s jabs – which were largely successful – utilising his fast hand speed well. However, these bursts of energy and enthusiasm from Parker appeared too infrequently, especially after such a slow start. 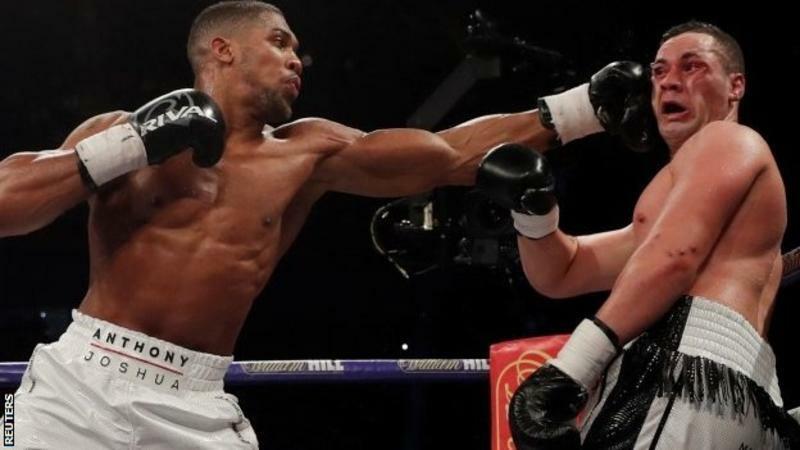 He connected with a few good counter-punches in round six and became more comfortable as the fight progressed, but the referee was eager to avoid seeing much physical contact in a clinch position, meaning he could not make things too awkward for Joshua. Body shots landed and you could tell that Joshua was getting increasingly frustrated with Parker’s tactics in the later rounds, though he was quite clearly ahead on the scorecards by this point. Every time he attempted to advance with good punch combinations, Parker would try and lock up or persist to bob and weave away towards a corner, forcing the official to get involved. Unsurprisingly, it left some supporters frustrated themselves – they wanted to see a knockout after all given the hype. However, with time running out and Parker not doing much of note to trouble Joshua too much, soon enough only a stoppage would see a surprise winner on this occasion. Safe, methodical work was then completed by Joshua to secure a comfortable victory after twelve rounds meaning his 100% knockout record is now over, but he’s still unbeaten. The three judges scored the contest: 118-110, 118-110, 119-109 in Joshua’s favour. After praising the UK boxing scene, he said he’d be fighting in the UK for the foreseeable future – unsurprisingly to loud cheers from those inside the 80,000 capacity crowd in Cardiff. He also revealed he’d be interested in fighting Tyson Fury next, if negotiations with the American are not completed soon enough. Parker was honest in his assessment of the encounter. “Today, I was beaten by a better champion and a bigger man. It was a good experience being here, I’m going to come back stronger – thank you for all the support tonight. We will be back again. I have to work harder, hit more punches and I’d love to have another go [in future]. From the opening exchanges, it seemed as though the result was set in stone – as harsh as it may sound from Parker’s perspective. The 26-year-old is a durable, credible opponent but did not have enough in his repertoire to do more than trouble Joshua, and it’s clear that his coaching staff underestimated how quick and effective he’d be, especially after his most recent fight against Carlos Takam. Since then he’s lost weight and naturally that has an advantage, both going into the latter rounds as well as generally being lighter on his toes – so Parker’s speed felt overexaggerated given he was only quick in short bursts, most of which Joshua was able to thwart effectively. It’s one of those fights that many will say didn’t live up to the billing but as Joshua said, this one was all about boxing finesse. The experience is undoubtedly going to help both, especially Anthony, with tougher and more unpredictable opponents to come in future. It’ll be interesting to see how Parker reacts to this defeat, as his unbeaten record comes to an end too. However, critics who suggest Joshua’s quality as a boxer is no more than being a glorified knockout artist should be forwarded the footage from this performance. Not his best, he’ll be the first to tell you that – but he’s improving all the time and didn’t look in much danger here, which is impressive to say the least.